Infrared imagery of Tropical Storm Khanun shows that the storm is weakening as it heads toward a landfall in the Chungcheongnam-do province of western South Korea. Khanun is already bringing rainfall and stirring up seas around southwestern South Korea. When NASA's Aqua satellite passed over Tropical Storm Khanun on July 18 at 0459 UTC (12:59 a.m. EDT), the Atmospheric Infrared Sounder (AIRS) instrument captured temperature data on cloud tops. Infrared imagery from the AIRS instrument showed that convection (rising air that forms thunderstorms that make up a tropical cyclone) was weakening around the center of the storm. The highest, coldest, thunderstorm cloud tops were south of the center of circulation, that's where temperatures were as cold as -63 Fahrenheit (-52 Celsius), and that's where the heaviest rain was falling. At 1500 UTC (11 a.m. EDT) on July 18, Khanun's center had already passed the Cheju Island, South Korea, and is headed for the mainland. 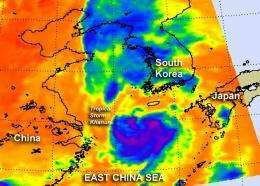 It is center near 33.9 North and 126.2 East, which is 30 miles northwest of Cheju Island. It is moving to the north at 15 knots and has maximum sustained winds near 45 knots. Khanun is creating 15-foot high seas in the East China Sea as it moves to a landfall. Khanun is expected to make landfall in South Korea, just south of the North Korean border. After landfall the Joint Typhoon Warning Center expects it to weaken rapidly.